The 24-year-old only son of assassinated former Pakistani prime minister Benazir Bhutto is due to launch his political career on Thursday, the fifth anniversary of his mother’s death. Bilawal Bhutto Zardari is among hundreds of high-ranking Pakistani officials, including the current president, his father Asif Zardari, who gathered to commemorate Bhutto’s killing in a gun and suicide attack during a 2007 political campaign rally. 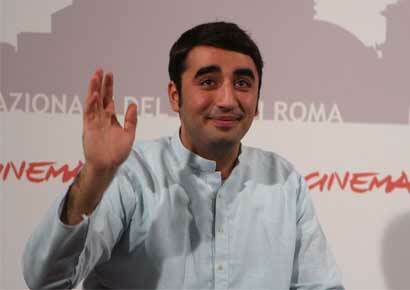 Ms Bhutto, whose father founded the PPP, was prime minister from 1988 to 1990 and from 1993 to 1996. On both occasions she was dismissed from office for alleged corruption. 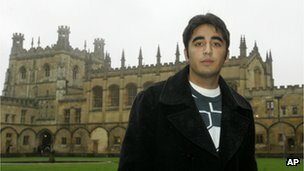 The Oxford-educated Bhutto, who was due to make a speech launching his political career later in the day, was named chairman of the ruling Pakistan People’s Party after his mother’s death. But he is not yet old enough to contest an election – the minimum age in Pakistan is 25 which Bhutto, who has his mother’s good looks, will reach in September. 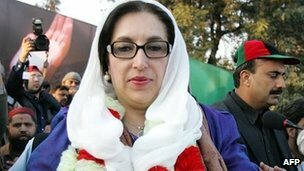 Benazir Bhutto has become a powerful symbol for the ruling party, which often refers to her as a martyr. The capital’s airport and a scheme to give cash to poor families have been named after her. Officials hang her portraits prominently on their walls. With parliamentary elections set to be held in 2013, the governing PPP is keen to use the rally as a show of strength to demonstrate that despite widespread criticism over its performance during the past five years, it still enjoys popular support. Her husband, who was elected following her death, is less popular. Zardari was jailed on corruption charges from 1996 to 2004 that he has said were politically motivated. Elections are scheduled for next spring but many Pakistanis are angry that Zardari’s government has failed to tackle Pakistan’s pervasive corruption or end the daily power cuts that have brought its industrial sector to its knees The elections should mark the first time in Pakistan’s history that one elected civilian government has handed power to another. The nuclear-armed country of 180 million people has a history of military coups. After one such coup, the new military ruler hung Benazir Bhutto’s father in prison in 1979. Later, Benazir Bhutto served civilian governments as prime minister twice but was dismissed on corruption charges both times. Her killer has never been caught, and a UN inquiry found that Pakistani authorities had failed to protect her or properly investigate her death. The UN also said that high-ranking Pakistani officials had tried to block its investigation. Benazir Bhutto was campaigning for reelection when she was assassinated 5 years ago. She plead for protection from Israel and the US. Meretz presents four-year path to peace based on Arab League initiative Are the Palestinians Ready to Share a State With Jordan?